Comfort en zwembad in een prachtige streek en voor een gunstige prijs. Property 7: Comfort en zwembad in een prachtige streek en voor een gunstige prijs. 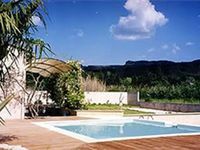 Beautifully furnished & equipped 3 Bedrooms/2 Bathrooms + pool, in the Luberon. Property 35: Beautifully furnished & equipped 3 Bedrooms/2 Bathrooms + pool, in the Luberon. Loved our stay. Great hosts. Read all to understand why not 5 stars. The house has very accommodating for 4 couple. the Bedrooms are separated enough to provide some privacy and there is a nice large great area for being together. Bathrooms were great with good pressure and plenty of hot water for a large group. Extra refrigerator.The pool area is even nicer than described. Clean and well cared for. Very private, spacious and quiet property. All amenities are close by. Hosts are on the property and were available whenever we needed some help. Provided tennis raquets, bikes and assisted us with getting a chef (Vitard - he was great). Why the 4 star instead of 5??? -mostly due to expectations only. The home is advertised as having A/C. It only has two portable units that are insufficient for hot weather. not what we expected. We had extremely hot weather and maybe not an issue frequently but it was for us that week. Also, we found out after booking that there were fees for linens and for towels. Both A/C and linen items may be a French thing...... Would definitely stay there again---pending the time of the year.